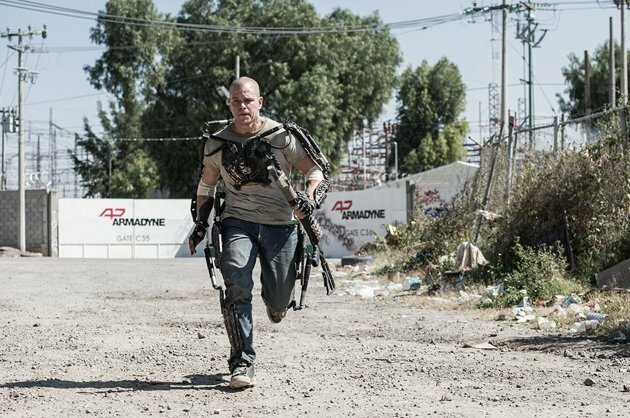 There’s a moment in Elysium, the new film from writer/director Neill Blomkamp, after another breakneck bit of action crashes us into act three, when star Matt Damon’s eyes close. I won’t get into the why and how of it, but I note it here at the outset because it engendered an uncommon feeling in me: genuine anticipation. I was ready for anything. Much dust has been kicked up as of late about movie scripts sticking too close to formula. Some blame the departed guru Blake Snyder, others the risk-averse Hollywood studio system overseeing production budgets ballooning out of control. However, like Looper last year (made by another writer/director wunderkind, Rian Johnson) or even Blomkamp’s first film District 9, Elysium creates and sustains a forward momentum that does not always feel inevitable. In fact, at times Elysium, despite its well-worked sci-fi dystopia setting and serious “hero’s journey” plotting, can downright surprise. It is 2154 in Los Angeles. We know immediately it is the future because the world is wildly unhealthy, over populated and hot; Jesus, it’s always hot. So, as you can imagine, life on earth is pretty miserable. The only relief, appearing forever out of reach, can be found on the enclave for the rich known as Elysium, a spinning Shangri-La space station – complete with magic med-bays able to heal anything – hanging above Earth. With its sleek outer shell and crisply manicured interior, Elysium represents a future that Stanley Kubrick could have dreamed up. For Max da Costa (Damon) however, Elysium remains just that, a dream. We are introduced to the day to day life of Max as he trudges to work, keeps his head down, and, despite a troubling wisecrack or two, appears to desire only avoiding a slide back into a life of crime with his old friend Julio (Diego Luna) and crime boss, Spider (Wagner Moura). For their parts, Damon brings his usual movie star presence and likeability to his heroic role while Luna, seemingly forever in the margin, ably plays the thankless role of sidekick. Meanwhile, as an actor unfamiliar to me, Moura punches up the proceedings as a crime boss using pirate spaceships to get people up to those tantalizing med-bays. His character, Spider, sits in a room full of screens, seemingly everywhere in this underworld LA yet pacing his command headquarters with a limp. Of course, this is all a build up to the predictable part; we know developments are being set into motion to get Max and his pals reaching for Elysium. The first development is introduced in a heavy-handed prologue where we learn of Max’s life long devotion to Frey (Alice Braga). Having grown up together and then apart, Frey is reintroduced into Max’s life as a nurse. She also happens to have a dying daughter. This feels immediately significant – though the daughter never quite rises above a sentimentality delivery device and/or prop. The second plot addition comes from Secretary Delacourt (Jodie Foster), who controls Elysium with as iron a fist as she dares, given that she must answer to a President and other governmental powers. As a villain, Foster, speaking sometimes in smooth French and always in clipped tones, brings some chilly professionalism to the proceedings, even if her character feels a bit stock. I was more into whatever it was that William Fichtner was doing as company bigwig John Carlyle, all robotic motions and brutally curt dismissals (when he instructs a man to not breathe on him I cringed in delight). I realize this already sounds like a lot and Elysium does labour to get all of these moving narrative parts humming. Blomkamp’s script juggles Max’s loaded childhood backstory (complete with foreshadowing nuns! ), multiple inciting incidents AND the necessary exposition for the world he’s created about as well as could be expected (and far better than most “high concept” sci-fi movies). Fortunately, Blomkamp has one more wildcard character and a few high powered ideas to juice the proceedings. 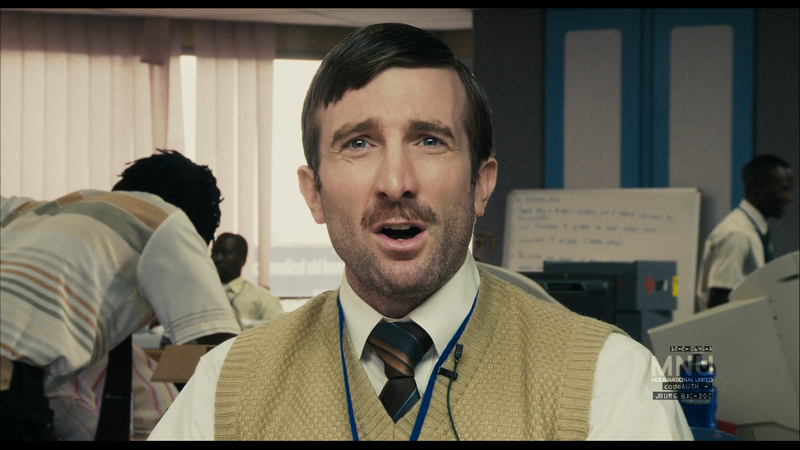 With the good and bad guys in place, the real winner of the character sweepstakes (and obviously, this is something I’ve thought a lot about lately) is Kruger, played with absolutely insane, reckless abandon by Sharlto Copley. He gets his own paragraph. Kruger is unveiled as some sort of wild man mercenary, reveling in the nastiness of future LA, and clearly enjoying his position as the violent cleaner for Delacourt. Copley is just magnetic in his scenes, acting as a total inversion of Wikas, his famous role from Disctrict 9. In Elysium, the friendly face and beguilingly goofy accent are curdled by extreme madness. It’s telling that despite the endless supply of serious firepower and vicious explosives he and his cronies have access to (sticky bombs, exploding ninja stars, force fields), Kruger does his best killing with daggers, his back-mounted saber and a smile. Kruger: easily the best part of Elysium. 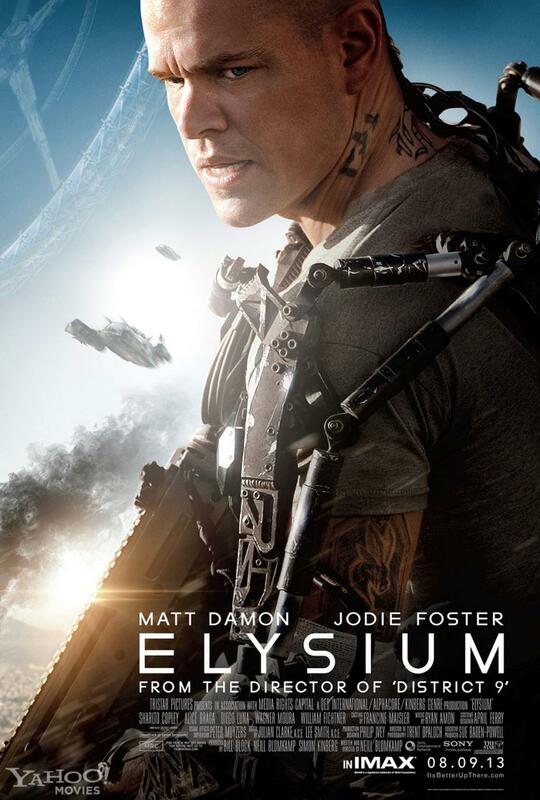 The film eventually does get to Elysium, after a few false starts and some rather violent and bloody gun battles. This takes us back to that moment I was talking at the start; Damon’s eye closing and the third act. Much like District 9, Elysium is a film laden with a message. Max’s journey becomes an allegory the film does not let you forget. The rich, having escaped a dying planet, can heal any sickness and live in relative peace (though they still all lock their doors. Go figure). Earth has been left to the poor, they have been shut out of universal healthcare. I know I’m not the only one to mention this, but it definitely feels odd to watch a movie with a uniformly Latino and black cast whose hero is played by the mega white Damon (to say nothing of that Portuguese name he gets hung with). I suppose it is not technically possible to pre-whitewash a totally fictional character. Still, I wonder how the film could have been different with perhaps a less obvious movie star choice, as charming as Damon is, in the lead role. The appearance of Blomkamp’s films, and his new ability to draw stars like Damon, deal in and around this kind of familiarity. We recognize the favelas of Brazil in his Los Angeles, we understand the have and have not divide that drives the narrative. We know the unsung hero, acting first for himself, will eventually be asked to sacrifice for some greater good. We don’t look too hard at the white hero in charge because it feels expected somehow. 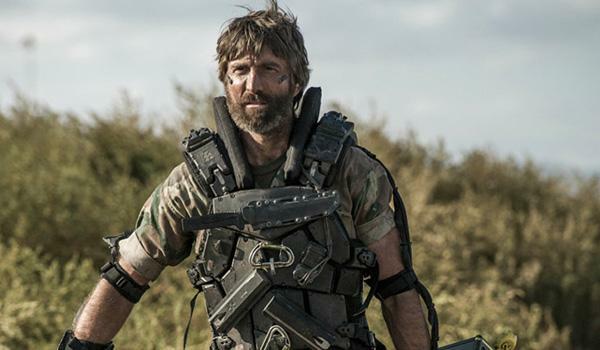 The fascination comes as we watch Blomkamp skillfully craft these elements (and there are a lot of them; I didn’t even mention Max’s radiation poisoning and exo-armor suit) into a narrative that does move. Like one of Spider’s pirate junk ships, at first it looks and feels too leaden to possibly fly, weighted with plot and dense meaning. Then suddenly, surprisingly, it goes soaring higher and faster than we could have expected towards its conclusion.